We discovered a rapidly developing situation where disinformation related to election integrity, voter fraud, and growing calls for violence and are being pushed by large groups of influential accounts on Twitter. 1. We found a sophisticated influence network that has been coordinating around voter fraud disinformation for more than 3 years. To give a sense of footprint — a sample of 200 accounts and tweets that mentioned these accounts resulted in over 140 million tweets in just the last year. 2. This groups of accounts have also been one of the largest drivers of conspiracies around Qanon, CaravanCrisis, FalseFlag Maga Bomber and others. 3. 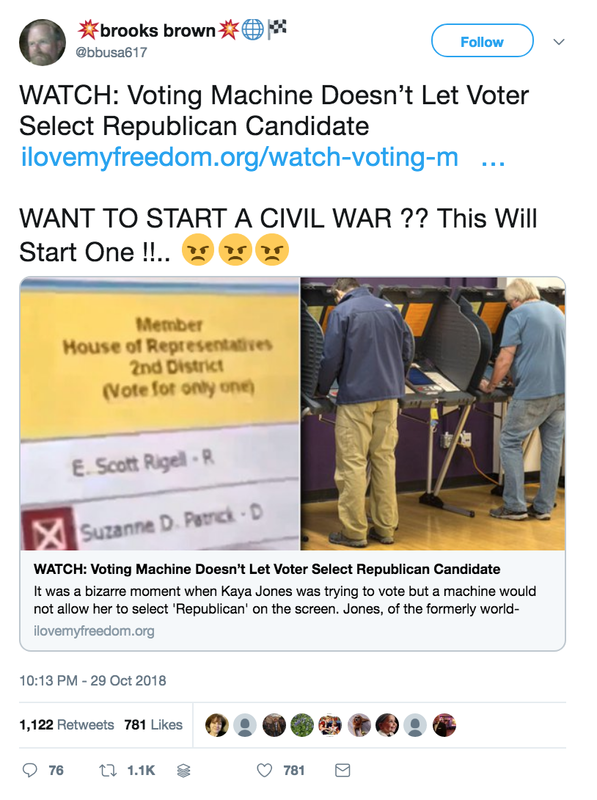 Doubling-down on calls for violence— Over the last 72 hours, these accounts have focused their emphasis to claim that there will be millions of people voting illegally with connected calls for violence after the election. 4. These groups of accounts seem to be far more advanced in amplifying disinformation in ways that mostly evade detection for researchers tracking online propaganda. 5. Whatever happens in the election, it appears that these accounts will be aggressively discrediting the integrity of the election and the democratic process with escalating violent rhetoric. 6. Not all of these accounts are bots, and that’s the point. Real Americans are getting caught up in the coordination around disinformation related to the election and calls for violence based on the results. Here is the full report, with summary, visualizations, and methodology. 1. Prepare the public for claims that this election was stolen by large groups of people voting illegally and try and mitigate those claims from inciting anger and violence. 2. Don’t let voter fraud conspiracies overwhelm credible reports of election security issues like voting machine irregularities in Texas or voter suppression in Georgia. These issues are real and there’s a real danger of distraction and false equivalence preventing the public from understanding what’s actually happening. We’re working with groups on the ground dealing with election interference. The goal is to identify and rapidly respond to disinformation and voter suppression efforts in collaboration with canvassers and volunteers who can reach and help voters on election day. 3. Don’t be scared. Use these developments to encourage your friends, family, and constituents to vote. Whether you’re a Republican or Democrat, Stacey Abrams, candidate for Governor in Georgia was on the Meet the Press this Sunday and framed the issue well. Chuck Todd asked if she thought the election would be fair — she said “Large groups of new voters in Georgia are engaged in the election for the first time, and a large part of that is driven by conversations around voter suppression. One of the best ways to encourage someone to use something is to tell them that someone is trying to take it away” — Bad actors are attempting to use this same effect combined with disinformation in order to rile up the most extreme elements of American society and confuse voters. Look at the facts and don’t be afraid to talk about election integrity and bring civil discourse to conspiracies around the results on Tuesday night. At the end of this article, you’ll find sample messages and developments based on what we’ve been tracking over the last 72 hours. 2. Share The Report — Conversations around VoterFraud, and the narratives that this network is amplifying have far-reaching consequences for the future of voting rights, voterID laws, and the 2020 census. Use this report in your own conversations to help us all understand the influence that shapes the reality, and ultimately policy that affects all Americans. If you don’t know anything about disinformation and influence operations online, we hope the beginning of the report helps you see the issue from a new lens. If you’re a data scientist or researcher in the space, we shared much more of our methodology than is typical in the hopes that others could use these findings and help stop evolving influence tactics from bad actors. It was an honor writing this report with the other primary authors, Zach Verdin, and Alicia Serrani. We also worked with academic supercomputing infrastructure, former JPL and NASA engineers, and people who were willing to spend countless hours looking at some of the darkest parts of the web in the hopes that the world could see this issue in a new way. Even though this problem often takes advanced technology and data science, we can only solve it by having the public involved and working together to find solutions. In the meantime, please vote and stay safe out there. 1. We’ve seen an increase in amplified narratives that combine disinformation on voter fraud/election integrity connected with calls to violence. Here are some examples. 6.) Combining old conspiracies with new combo election integrity and voter fraud conspiracies. Guardians.ai trying to help in the fight against information warfare and engineered volatility. Care a/b climate risk, AI, evolving gov. Mr. Rogers fan.